True Craft Confession: I bought these plastic gems at Michaels a few weeks back with plans to use them for a mosaic inspired fashion DIY. I've had these espadrilles for a while, but I never wear them because they're kind of boring. 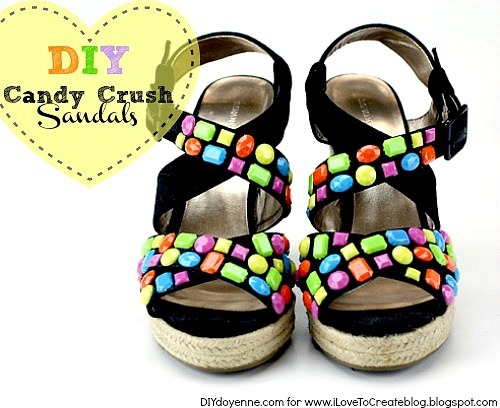 It wasn't until I took the pics of the finished sandals that I realized they look just like Candy Crush Saga! Too fun! The colors here are vibrant, not quite neon, but very punched up. You could use clear foil backed stones for a totally different effect. I tried a variety of adhesives, but the best by far was Aleene's 7800. It sets quickly and it's thick, so the stones don't slip around on the straps while they dry. Take your time and work methodically. I tried picking the stones up and dipping them in the glue, but I found that spreading the glue on with a crayon and placing them by hand worked best. When you finish, just shave off the end and your crayon will be back in business! Step one: Dig through the gems and pull out the smaller sizes. Brush your shoes off to be sure they're clean. Step two: Squeeze a dab of glue on scrap paper. Use a crayon to spread a thin layer of glue across the center back of the gem, you don't have to work to the edges, when you place the gem down the glue will spread. Start with the front straps. Step three: Work on the upper strap. I only decorated the front upper strap, because the back strap gets more friction and I don't want my gems to fall off! Step four: Finish both shoes. Allow to dry overnight. Aleene's 7800 adhesive! Best of all, you can finish these in about 30 minutes. Fun, fast, fabulous...and affordable! What's not to love? I'm seriously crushing on these and I don't even play Candy Crush Saga. Visit iLoveToCreate on Facebook and join the crafty conversation! You can find me at DIY Doyenne: Style isn't a number. You would rock these! 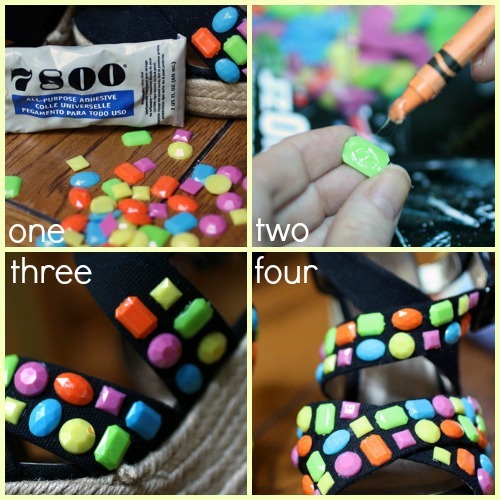 I loved your Candy Crush projects...add these all together and you'd have a funktabulous ensemble! Love, love, love these! Thanks for the how-to. Cute pair of shoes! Love it! :) really creative! hey buddy great post for you get how to get free robux on roblox without pay any single coin for this than click here. Get free amazon gift card codes by clicking here.